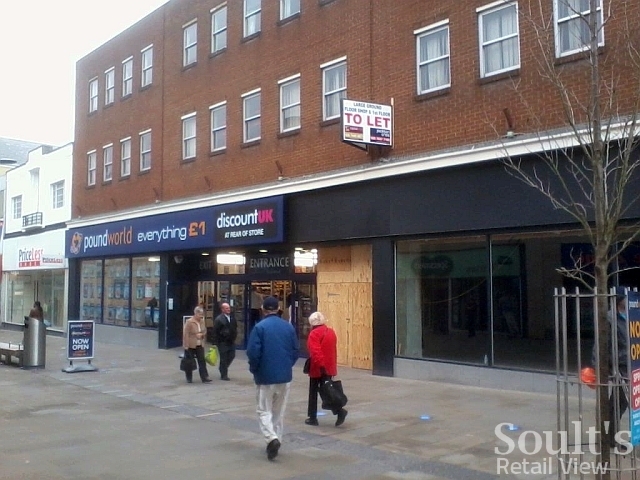 Many thanks to Soult’s Retail View reader Lee Sartin, who has sent in a picture of the dual-fascia Poundworld and Discount UK store that opened in Swindon a week ago. He reports, via Twitter, that the store “is very long inside but looks great”, and that it features a “good product range”. 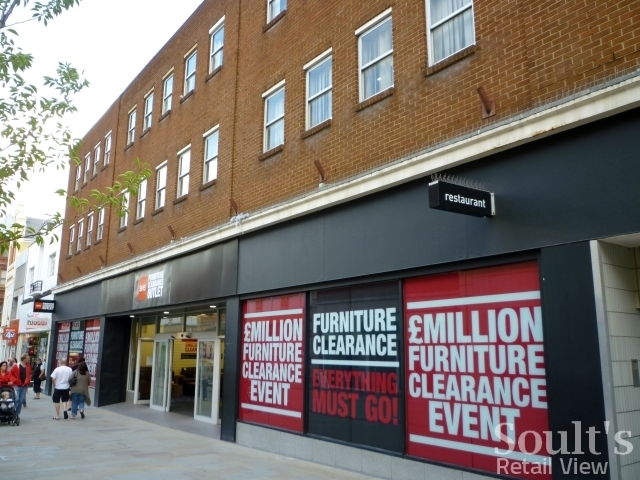 As can be seen from his photo, however, Poundworld has only taken over half of the ex-Woolies and BHS site for its 14,000 sq ft store, meaning that there remains a decent-sized portion still to be let. Perhaps another expanding value retailer, such as Store Twenty One (whose nearest store is currently the QS in Cirencester), will step in to take what’s left, as it has in South Shields? I reported last week that the Swindon Poundworld and Discount UK “is being treated as a ‘2-in-1’ shop – where both brands sit within the same space under a shared fascia and frontage – rather than as two separate stores side by side”, and it’s interesting to see how this has been carried out in practice. 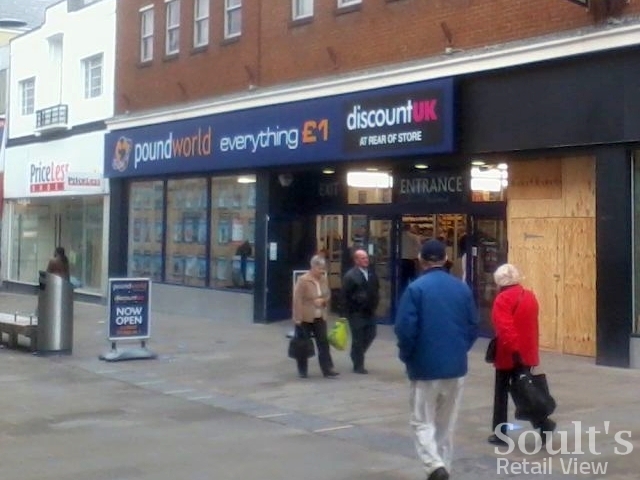 Reflecting the fact that Poundworld occupies two-thirds of the space, its logo is very much dominant on the fascia. I’m not sure that the current juxtaposition of the Poundworld and Discount UK brands is entirely successful, however, and a better approach might be to give both logos equal billing – and a bit more room to breathe – on a common black background. The challenge, presumably, is dealing with Poundworld’s ‘Everything £1’ slogan, and making sure that it’s only associated with the Poundworld section rather than with the multi-price Discount UK part. This would account for why the current fascia so clearly demarcates the Discount UK logo from the ‘Everything £1’ wording. To reduce confusion and clutter, however, I’d perhaps jettison the ‘Everything £1’ slogan from dual-fascia stores in the future, on the assumption that enough customers already recognise Poundworld – and, indeed, its arch-competitor Poundland – as single-price retailers. Interesting! Middlesbrough’s Woolworths had a trial Store Twenty One too (see http://www.soultsretailview.co.uk/2012/02/21/one-town-five-stores-tracking-down-middlesbroughs-ex-woolworths-part-3/), but it only opened about a month before Woolies collapsed – rather unfortunate timing! Thanks for the mention. It’s interesting to see how they have gone about the dual fascia. Funny you should mention Store Twenty One. Shortly before Woolworths went into administration, a bit of money had been spent opening a trial Store Twenty One concession within the Swindon store. I don’t remember it being to busy on the number of occasions I visited the store. It wasn’t very well placed due to it being towards the rear of the store. I’m sure their product lines have come along way since those 4 years ago. Not sure if they will venture back into Swindon. There is competition from the large Primark in Regent Street and Swindon is one of the few places to retain its Peacocks store.